We have some great news for all our premium subscribers: improved 3D visuals! The most important improvement? It makes your floor plans look really good in 3D. Besides that, it’s very easy and fast to create them. And last but certainly not least, there are no extra costs! The new 3D visuals are directly available for everyone with a premium account, without any additional costs. Real estate professionals with a Pro or a Partner account can create an unlimited amount of 3D visuals. People with a Plus account can create up to 25 visuals per year. You can create a 3D visual by clicking on the Export icon in the menu bar and selecting the ‘Render 3D image’ option. A menu appears that lets you choose the resolution and an angle of view. South east, south west, north west, north east and top down. Within a couple minutes you’ll receive an email with your 3D visuals attached. Want more control? That’s possible too. 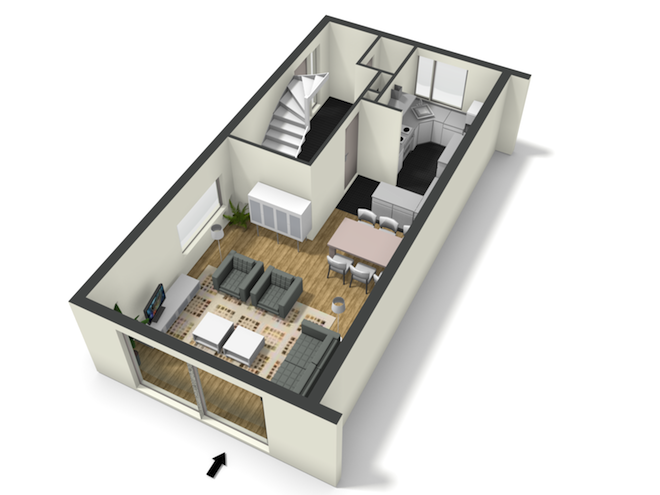 Open you floor plan in the 3D view and move the view to a desired position. Now export it and the 3D visual will have a similar view to one on your screen. There is another very interesting feature that makes the 3D visuals even more attractive. You can color the wall tops yourself! This gives you the power to customize the look and feel of your 3D visuals. We just can’t wait to see your visuals! Please use our forum for any remarks or suggestions.